Here in the RTG office, we have just about had our fill of easter choccy and amusing ways to insert the word ‘egg’ into our conversations. 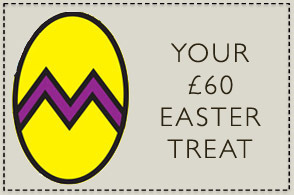 But our fabulous, or dare we say, eggceptional Easter offer is still going strong and has proved our most eggceedlingly popular offer to date (ok, maybe we’re not done with the egg pun yet). For our Blog and Facebook followers only you still have till the 12th of April to save £60 on any 3 massage treatments bo oked. So what do you fancy? Aromatherapy or maybe a Stress Relief Massage? Both perfect for winding down from your wound up sugar fuelled sweethearts. Or perhaps your shoulders are up around your ears, in which case we recommend a divine Deep Tissue massage. If like our leading lady Natasha, you store your tension in your head and neck then Indian Head Massage is what you need to melt the stress away and restore calm. If you can’t decide we’ll happily help you choose. Call our customer service team to discuss the right treatment for you (we promise to keep the egg jokes to a minimum).